Today Bugaboo is sponsoring the Do You Stack Up Challenge. That's right, play along with DYSU and you could win 7 Bugaboo Images! The challenge this week is to use distressing. I used Jodie's Kidlet image called "Baseball Girl"
I used some distress ink on the image and used my Tim Holz distressing tool to rough up the edges of the card. There are so many ways you can use distressing on your projects. Pick one..or two and play along! This is so cute. Love the image and the colours are fabulous! 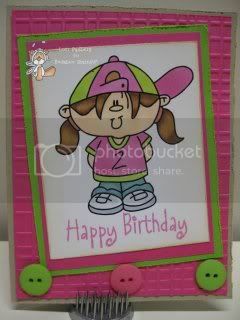 Very cute, love the embossed background! Thanks for Cooking It Up With Katie! You did a great job with her hair, love the shading! What a fab card. So fun and cheerful. I'm so glad you got to GDT with us at DYSU! It was great having you along. Thanks for cooking it up with Katie this week.